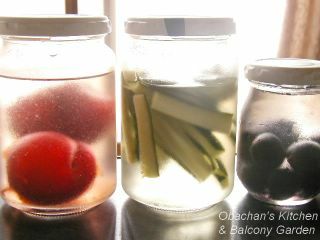 See the result of my project inspired by rae's post: grape (left) and plum (right) infused vodka. To tell you the truth, the grape infused version is already gone... I drank it up more than 10 days ago. 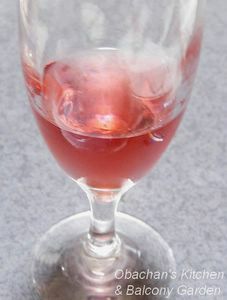 Good thing that I didn’t forget to take this shot before emptying the glass. As you can see, its color turned a lot darker compared to how it was about a month ago. Color-wise, I like the amber color of the plum infused one much better, but the grape version was definitely a lot sweeter and flavorful. The cucumber vodka didn’t turn out good so I didn’t bother to take a photo. Looks like WDB (Weekend Dog Blogging) has been widespread in the blogsphere recently, but mine is Weekday Dough Blogging. 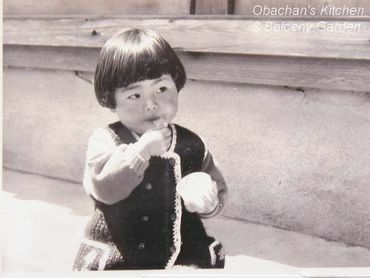 Poor obachan doesn’t have a furry animal to blog about on weekends (or weekdays). And unlike those on WDB or WCB, eventually she is going to eat the very thing that she’s feeding and blogging about. Sadistic! Anyway, as you might have noticed, this is not the same dough as this one in my 1st sourdough starter post. The first batch with bread flour was thrown away because it started showing a couple of pinky-orange colored spots. (I cultivated something other than yeast, didn't I?) That was Charlie I. Then I started my 2nd batch with whole wheat, Charlie II, and this is his 5th day. And I’m not sure if he is ready to go into fridge of not…I do see tiny bubbles on the surface, but seeing from the side, I don’t see bubbles like this. No, not at all. So I still keep feeding him every 12 hours, and started worrying about how much mineral water and flour I would have to invest on him. To be honest, I don’t now much about Turkish food. I might have tried a few of them without knowing that they were Turkish, but I’m not sure. Of course I didn’t know what hummus was -- I didn't even know that it was food. Then a few days ago, when I was bloghopping all over the world, I accidentally found this recipe on Isil’s site. It looked really attractive to me especially because I had some eggplants that needed to be used up. I love grilled eggplants. I love chick peas. Therefore, the combination of them must be something I would love... but you never know how it would taste until you actually give it a try. So why not? I had all the ingredients in my kitchen except chick peas, and I bought the peas at a supermarket on my way back from work this afternoon. Then I spent some quality time in the late afternoon with my new electric blender, and finally I was able to take a shot of the result before I left my apartment for my night-time work . 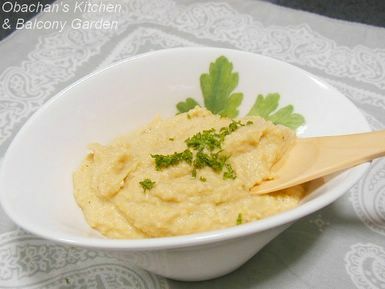 Yes, dear readers, this is the result of my very first attempt of trying out a Turkish recipe – hummus with eggplant! First I tasted this with a small piece of soft and fluffy Japanese bread, and thought that it was a bit too garlicky. ( I used real big cloves.) So I added a little more chick peas and a bit of milk to make it milder. It worked!! They say that hummus is traditionally served with pita bread, but I have no idea where I can find it around here. Oh well, at least I can get some crackers or cracottes tomorrow. What else would be good to eat with hummus? Any suggestions? BTW, this nice looking bowl and spoon are a present from my boss. 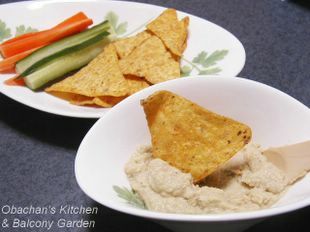 They made a perfect debut with my very first attempt of hummus. Yesterday was actually my lucky day -- I got a present not only from my boss but also from a colleague. She said that someone gave her bunch of home-made moromi miso, so she gave me some in a big tapperware. This is not as sweet as the regular ones sold at stores. 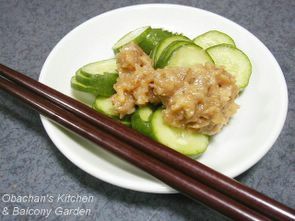 Thanks to her, my late night supper was upgraded with a small plate of moro-kyu (cucumbers with moromi miso ) last night. Right now I’m enjoying the hummus with veggie sticks and Doritos. Mmmm…too bad there’s no beer. I made this to use up the carrots left from the carrot halwa I made the other day. 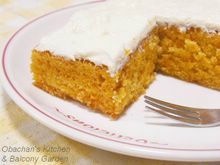 Since I’m on a real tight budget now, I didn’t allow myself to buy walnuts and cinnamon to make this cake. So this has only about 2/3 of the amount of cinnamon called for in the recipe and absolutely no walnuts. The taste is… I would say C+. And I froze the leftover cream cheese frosting. Here’s another Japanese dish that can be a vegetarian dish if the butter was replaced with something else. I highly doubt if this can be called “authentic,” but I like it anyway. 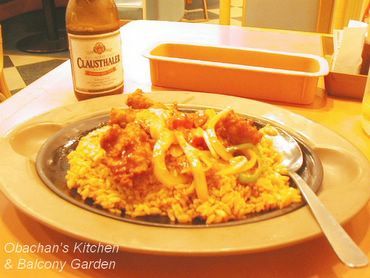 I came up with this recipe many years ago, first being inspired by a few Japanese women I met in the U.S. and later giving it a few twists of my own. Wash bean sprouts and drain. Slice garlic. Slice tofu into 3 to 4 pieces and roll in flour to coat. Mix sugar and all liquid ingredients in a bowl. Heat butter (or veg. oil) in a frying pan and sauté garlic slices. 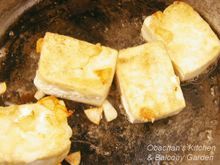 Add tofu slices and fry both sides until golden brown. Transfer tofu to a plate. DO NOT WASH THE FRYING PAN YET! Add bean sprouts to the same frying pan to sauté over mid-high heat only briefly. Pour in the liquid ingredients mixture. Heat until the sauce is hot and pour the sprout-sauce mixture all over the tofu. Garnish with minced scallion. Serve hot. 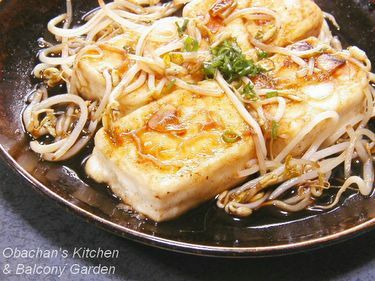 When you eat, make sure to put a little bean sprouts and garlic slices in your mouth with tofu. IMHO, the harmony of those three is what’s great about this tofu steak. BTW, I like using silken tofu for this dish. Is Marriage Life As Sweet As This?? This afternoon I tried out a dessert recipe that I found in a cooking book from a Japanese magazine, ESSE. The issue was Vol. 26 of the ESSE Book Series, featuring "ethnic dishes you can make at home." The dessert I picked was called halwa, and the book said it is often served at wedding feast in India. 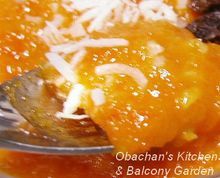 The recipe was a less-sweet version modified for the Japanese palate, but still the dessert turned out very sweet! It wasn’t an unpleasant kind of sweetness, though. I liked the taste alright... but I couldn’t help using a dash of lemon to give it a little bit of sourness. Also I needed a glass of rather strong, unsweetened iced tea to accompany this rich dessert. It’s sourdough starter. This is how it looks on Day 1. Actually I like this kind of project --- keeping (growing?) something in the fridge, feeding it once in a while. I was one of those who jumped on the "Caspian Sea yogurt" bandwagon, though I didn’t continue making it for more than a few months. I got lazy, as you can imagine. Because yogurt is something you eat without heating (usually, not always), I thought I had to be careful about sterilization. Soon I started doubting if the yogurt was so exceptionally nutritious that’s worth all those troubles, and finally quit making it. But sourdough starter is another story; it is not meant to be eaten raw. It sounds like a lot easier thing to take care of. And unlike the Caspian Sea yogurt, I might really love the taste of sourdough bread. 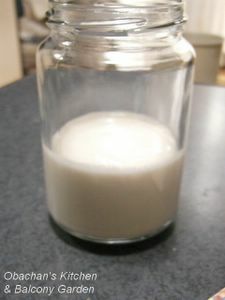 But I didn’t try making the starter right after I read Rachel’s posts, because this summer there was absolutely no space in my fridge to keep the starter in a jar all the time. Well, as the result of the heavy duty clean-up I did the other day, now my fridge has space for that. I’m READY. Another dish with mizuna (potherb mustard). If you are looking for a Japanese vegetarian recipe, this might do. 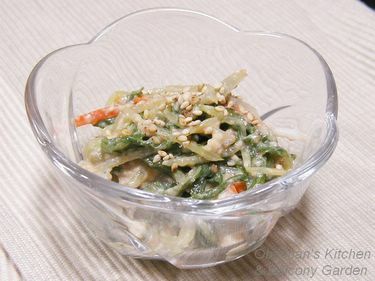 It’s called shiraae (salad with tofu dressing), one of Japanese traditional salad dishes. 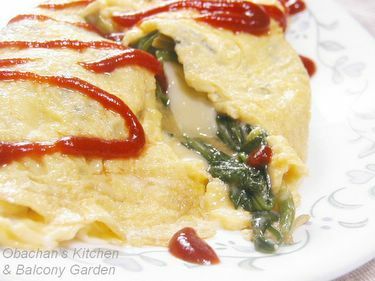 This time I used potherb mustard, but it can be replaced with spinach or other greens. 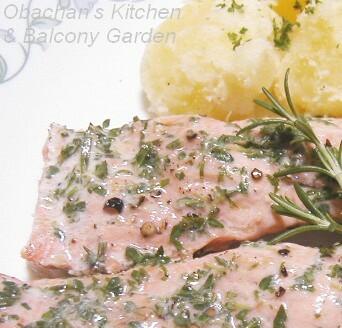 With some exceptions, the veggies used for shiraae are usually blanched briefly. * Amount of seasonings to be adjusted according to the type of tofu and vegetables used. 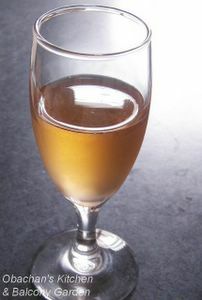 If dashi is not available, it can be omitted. Drain tofu well. I usually wrap it with a kitchen paper, place something flat (like a plate) on top, put a small bowl filled with water on it and leave for about 10 minutes. If in a hurry, you can crush tofu, wrap with a kitchen paper and microwave for a few minutes. Cut carrot into apx. 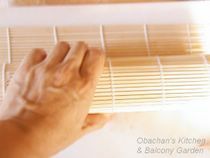 1.5-inch-long thin strips. Blanch mizuna and the carrot briefly and cool in (ice) water. Drain well. 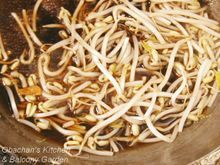 Wash bean sprouts and drain. Cut mizuna and sprouts into apx. 1.5 inch long. Add the vegetables into the dressing and mix. Serve with a pinch of sesame seeds sprinkled on top. 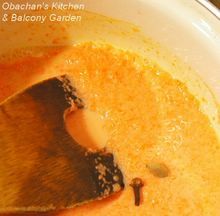 There are many shiraae recipes, but I usually start with 1 Tbsp of each seasonings, as in the recipe above, and make last-minute adjustments according to the taste of the vegetables used, or the type of tofu used (and how well it was drained), etc. Also tried mizuna stir-fry for lunch yesterday. 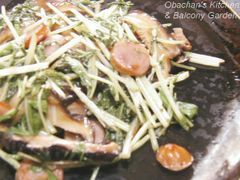 Ingredients: mizuna, sausage and shiitake mushrooms. Seasonings: sesame oil, soy sauce, sake, salt and pepper. A dash of lemon at the end. * This idea was originally introduced in a TV-show. I was going to buy, or at least take a pic of, a real cute “moon-viewing dumpling set” I found in town yesterday, but I just forgot. I was busy all afternoon and evening, making rather fruitless efforts to enjoy moon-viewing and related events. (Details here.) And this is what I got instead. Please note that this was a special, big decoration for an event at a famous moon-viewing spot in a prefecture full of heavy drinkers. 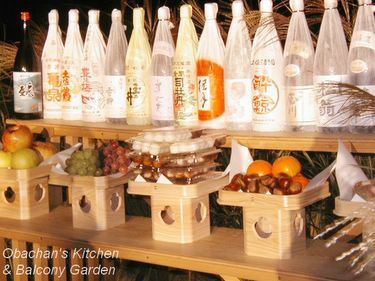 We don’t make something this big --- with this many sake bottles --- at each household in Japan to appreciate the harvest moon. This pic does include some typical items for our moon-viewing in Japan, though, like dumplings, fruits, taro potatoes and susuki (Japanese silver grass). When I was about to leave the office after work yesterday afternoon, my boss’s neighbor dropped by. 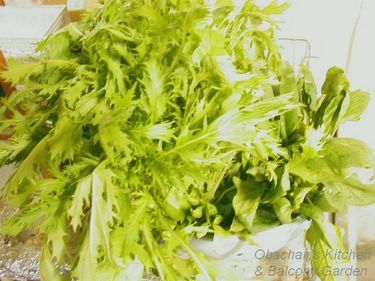 He gave us loads of fresh green vegetables: mizuna (potherb mustard or California peppergrass) and spinach! I was really happy, but I wasn’t sure what I should use mizuna for. Back in my room, I googled for a while to find a good way to use the mizuna. This green vegetable is commonly used for nabe (hotpot dish) in winter, but it’s still too hot for that. Salad seemed like a better idea, so I picked a salad recipe with an interesting dressing. Here! The greens turned into these dishes. Oh, this was heavenly :) Sorry, I'm a ketchup freak. Though the recipe I found on the net used raw mizuna, I softened mine by powering hot water all over. The good thing about this vegetable is that its stems stay very crispy even after being heated. But mizuna has a slight bitterness and that's why I was not too crazy about this vegetable. I Love the Refreshing Aftertaste! This is the best outcome I got from a few try-outs I did this summer. 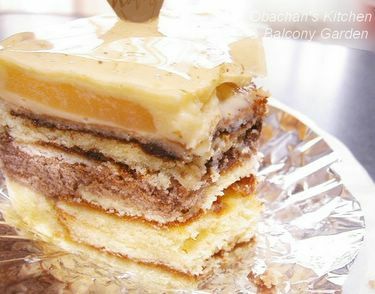 Dear readers, this is supposed to be “earl grey tea cake roll with fig and cream filling.” Weird? Different? But this was not as bad as you might think, honestly. I got the idea of this unique cake roll from our local pastry shop’s “ Cake roll of the month.” The one displayed at the shop looked so scrumptious, but was expensive, so I thought about making one myself. It is fig season now and the fruit is on the shelf at almost every supermarket. So why not?! 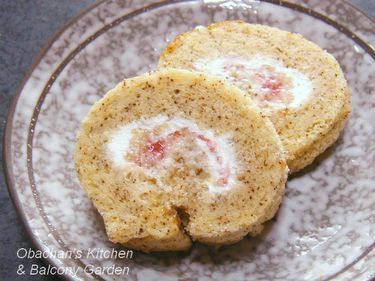 I googled for a recipe of “black tea cake roll” and found one at a Japanese recipe site. It needed to be downsized to half, but seemed suitable for what I was going to make. The twist was, of course, the fig; I expected that adding it to the cream filling would make the rolling-up part difficult, and I was right. This was by no means an excellent job, but I have an excuse. My small oven can only take 18x18 cm square cake pan inside, and it’s more difficult to roll up when the sponge cake is smaller. (Right?) And with the fruit chunks in the filling, you know. Maybe I should have baked a thinner sponge and let the air out of the batter more thoroughly before baking. Tastewise, this wasn't bad at all, honestly. 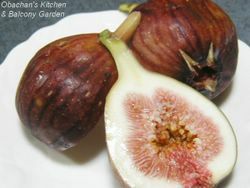 The cream-and-fig combination was nice with the pleasant crunchiness of the fig seeds. 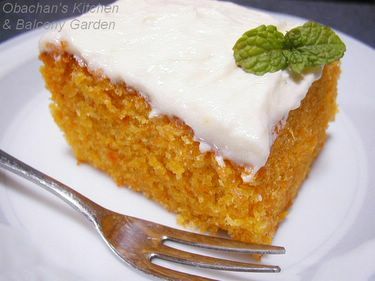 What I loved the most was the refreshing aftertaste from the ground earl grey tea leaves in the sponge cake. I’m interested in trying "earl grey cake roll" with other fruits like pear or persimmon in the filling, so there will be several more cake roll entries on this blog this autumn. Looking cool and refreshing, don’t you think? 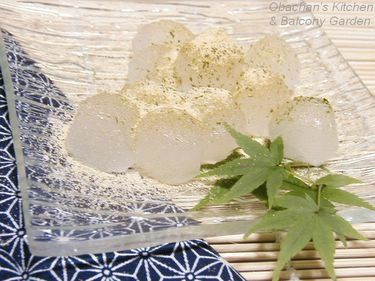 These are called warabimochi (bracken-starch dumplings). 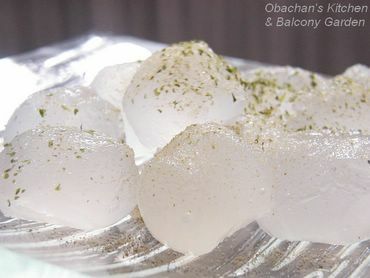 For those who have never heard of such a thing before, warabimochi is one of the refreshing Japanese summer sweets and awfully easy to make. 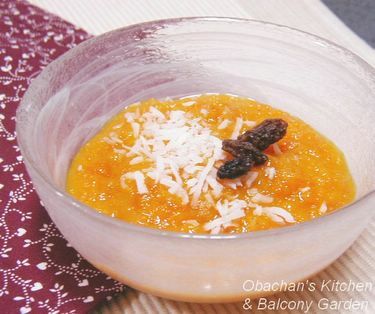 You just mix bracken-starch powder, sugar and water, heat in a saucepan, pour into a vat, refrigerate, and when settled, cut into bite-size chunks and sprinkle/coat with sugar-mixed kinako (roasted soybean powder). Some people love them with dark syrup. Those who know warabimochi might feel like yelling at the photo, “But obachan, what is the aonori (green laver flakes) doing on top of the dumplings? Hey, they are not takoyaki!! ” I know, I know. It is not very common to eat bracken-starch dumplings this way. But I like it because a little bit of laver flakes adds a refreshing flavor. It is not my own idea…it's something I learned last year from a vendor. 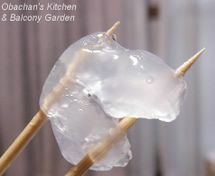 This may not apply to Kanto area, but in Kansai in summer, you often hear the pre-recorded voice from warabimochi vendor’s van, repeating “waaa--rabiii--mochiiiii---.” I usually buy the dumplings at a supermarket, but just once last summer, I bought some from a vendor in Kochi city. He asked me if I wanted aonori in addition to kinako, and from curiosity I said yes. 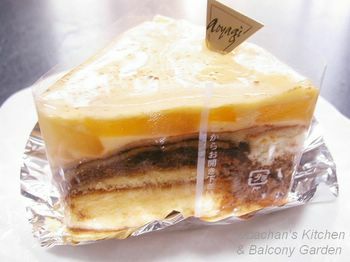 Since then it has been my habit to eat this dessert with both kinako AND aonori. For the painful work of cleaning up the closet and kitchen that I did last weekend, I bought myself a reward today. It’s an electric blender, the cheapest kind that has been on sale at the mall for months. I had always wanted one, but it was not the price that kept me from buying one this summer. I simply couldn’t stand the idea of adding one more thing to the chaos in my kitchen. The mess was almost making me nuts and I repeated in front of the mirror hundreds of times, “No more kitchen utensils until I get rid of all the crap! 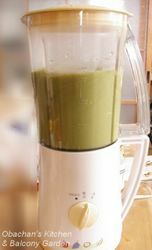 !” Well, I finally did the major throwing away this weekend, and now this new, inexpensive electric blender is officially welcomed in my kitchen. 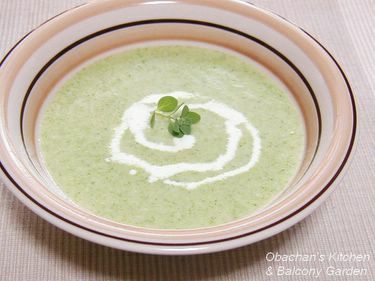 Of all the things you can make using an electric blender, I chose “broccoli potage soup” as the first mission for this newcomer. The reasons were: 1) I like broccoli, 2) for some reason I like green-colored soup, and 3) there were some leftover boiled broccoli in the freezer that I wanted to use up. Even though I call it “broccoli potage,” I used other vegetables, too. 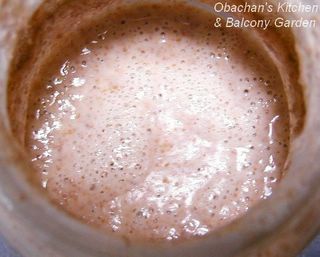 Cooked onion, garlic and potatoes were thrown into the blender in addition to boiled broccoli. My home-made chicken stock I froze a few months ago was also used for this soup. * Sorry, I replaced the photo on top because I couldn't stand the color of the previous one. 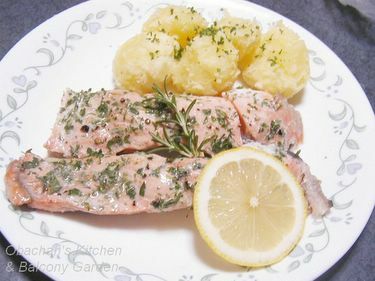 Salmon fillets were on sale yesterday at a nearby supermarket and that triggered me to make herb-grilled salmon for supper last night. 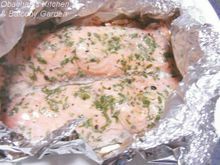 At first I was going to use a frying pan, but while googling to find a sauce recipe, I changed my mind and decided to go for foil-grilled salmon. 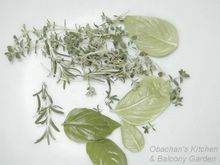 I thought that being wrapped in aluminum foil, the herbs won’t get burned and would keep their fragrance better. Unfortunately yesterday was certainly not my day. After I seasoned the salmon fillets with salt and pepper, I wanted to sprinkle some wine all over, and remembered that I had used up the white wine the other day. So I used a little sake instead. 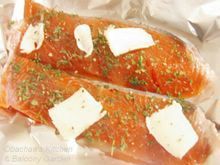 Then I topped the fillets with butter chunks, wrapped them with aluminum foil, sealed the edges carefully, and heated in toaster oven. While I stood helplessly in front of the fridge, the salmon in the toaster oven was done. Actually, they looked pretty good when I opened up the foil. 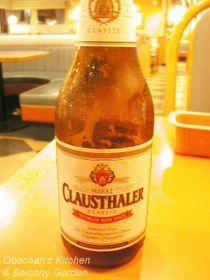 As for the drink, I tried something I have never tried before: clausthaler non-alcoholic beer. I didn’t want to drink real beer because I was determined to go jogging afterwards. Maybe that was not a good plan… I ended up ordering a dessert there, too, thinking that the jogging afterwards would burn the calories. 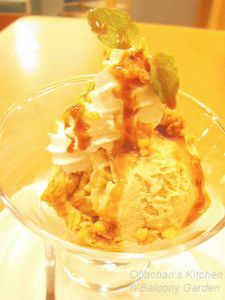 Dessert: Ice cream with caramel sauce. Just wanted something to make up for the long day I had yesterday. This cost 200 yen and I thought it was worth the price. My grandparents used to raise hens and it was my job to pick eggs every morning when I was a kid. As a reward, my mom would put a fresh, raw egg yolk on a bowl of warm rice for me and seasoned it with a little soy sauce (and a pinch of ajinomono --- the inevitable.) It was a sheer joy to break the bright orange-colored egg yolk to mix with the soy sauce first, and then with the whole rice in the bowl. I loved the dish so much that I had it almost 3 times a day every day for a few weeks, and I ended up having hives. Now I don’t really feel like trying it any more. This was my typical lunch on weekdays in my childhood (when not at school). My parents were both at work on weekdays, so I had lunch with my grandparents at home. Our lunch was usually something easy to prepare --- leftover miso soup from breakfast, tofu, pickles, leftover simmered food from the night before or stir-fried veggies, AND this “fish meat hamburger steak.” I guess it was not too different from fish meat sausage, but just shaped in a bigger, ham-like shape, and all I had to do was to slice it and fry in a frying pan. Maybe it contained bunch of chemical additives at that time, but I just loved it with a little ketchup. I'm eating something else, not onigiri in this photo. The lady next to me is mom's friend. My house was really close to the beach ( 1 min walk, maybe?) and my family often went on a picnic there. 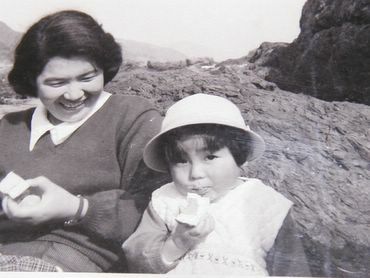 It was rather a rocky seashore, and in my childhood picnic photos, we are usually sitting on big rocks. My mom often made tamagoyaki-wrapped onigiri (rice balls wrapped by thin omelet) for me and my sister. She seemed to have believed that tamagoyaki-wrapped rice balls were more sophisticated than seaweed-wrapped version, and IIRC, she would add a little ajinomoto to the rice before making the special rice balls. This was actually the baby food that my sister and I were most often given. Either my mom or my grandma (or sometimes dad or grandpa) cooked leftover rice in leftover miso soup, added some hot water if it was too salty for babies, and fed us with it. 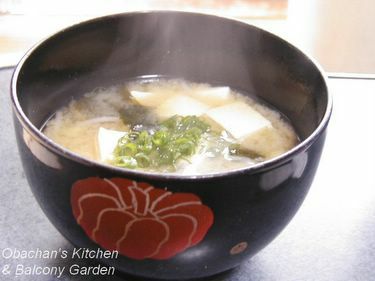 When we got older, we were fed with egg-mixed version of the miso soup porridge more often. I still love it and make it once in a while. This is a Japanese style instant pudding mix from House (a Japanese brand), which was a big hit about 30 years ago. All you had to do was to add hot water to dissolve the mix, then pour in small pudding cups and refrigerate. Unlike the real custard pudding, the texture of the "purin (pudding pronounced in Japanese way)" was so soft. Actually it was quite a culture shock when I tasted a steam-baked custard pudding for the first time. And here, as the rule says, I made a list with my site at the #5 position. Those who are tagged by me will need to remove the #1 from the list and push up the 4 remaining blogs, then add your blog as #5. (Link to the meme post of each blog on the list.) That’s the rule…I think. Tosa is the former name of Kochi prefecture. Until the end of the feudal era (about 200 years ago), this area was called Tosa-han (domain), ruled by the shogunate. 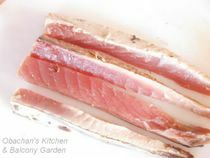 Even today, many local cuisines or dishes with our local specialty, bonito (or dried bonito flakes) are still called Tosa-something. For example, Tosa-ni means food simmered with lots of bonito flakes. This Tosa-maki is a rolled sushi with seared bonito strips in, and I assume it was named so because seared bonito is Kochi’s most famous local dish. Anyway, we serve this Tosa-maki at the izakaya I work at, and that’s the only reason why I got familiarized with this sushi. 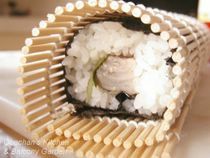 My mom never made this at home, and I have never ordered one at any of the sushi restaurants I've visited in and outside Kochi. My life could have ended having nothing to do with this local dish at all, if I hadn’t tasted a piece of leftover Tosa-maki in the izakaya kitchen. Well, when something happens, it just happens, you know. 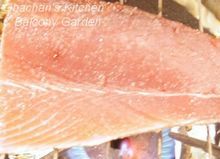 This afternoon I found myself searing a bonito fillet in my kitchen. It was a mere curiosity --- I just wanted to see how close my Tosa-maki could get to what they serve at the izakaya. 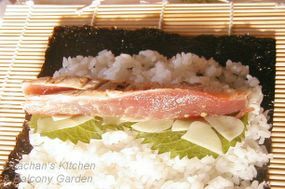 To make Tosa-maki, you need bonito fillet, shiso (green perilla) leaves, garlic cloves, wasabi (Japanese horseradish paste), sushi rice and nori sheets (dried seaweed). I’m not going to post my recipe here because I think there’ll be very few people who would want to try this out. This is one of those dishes that only locals love, I suppose. 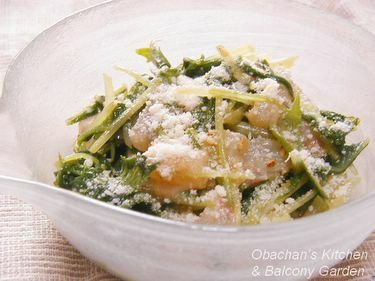 The raw garlic slices and shiso leaves can be quite strong and I wouldn’t be surprised if the majority of people in this world would find this dish unpleasant. Even I cannot eat one if the chef happened to like it strong and put so much garlic and perilla in the roll. 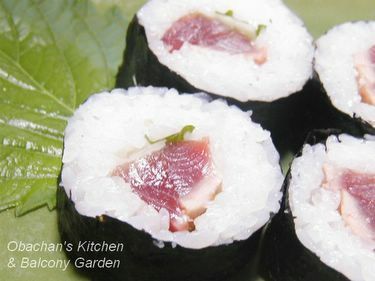 But when the amount of all the ingredients is just right for you.... it brings out an unexpected harmony, and that’s what I like about this Tosa-maki sushi. STEP 1 --- Cooking rice. I left the job to the electric rice cooker, of course, but I did adjust the amount of water to cook good sushi rice. 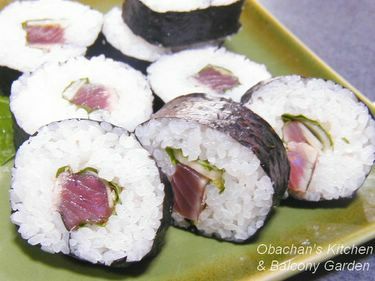 They say that you should use just a little less amount of water than usual for cooking sushi rice. Though some people don’t do this, at our izakaya they sprinkle salt over the bonito fillet before searing, so I did the same. Then I sliced it into several strips. I hate using my small kitchen knife for slicing fish, but that’s all I have now. STEP 3 --- Preparing sushi rice. Before the rice was done, I prepared seasoning vinegar, mixing vinegar, sugar and salt together. I’ve read somewhere that the proportion of those ingredients should be basically 5(vinegar) :4(sugar) :1(salt), but it sounded a little too sweet for me. So, for 1 cup of rice cooked, I mixed 5 tsp vinegar, 3 tsp sugar and 1 tsp salt in a bowl and tasted it. Mmm… I would modify the proportion to be 6(vinegar) : 3.5(sugar) : 0.5(salt) next time. It was just too much salt for me. The vinegar should be mixed into rice while the rice is still hot, but the rice has to be cooled down to body temperature to be used for sushi. While cooling the rice, I sliced the garlic ---- No, sorry, I’ll be honest. At that point I noticed that I forgot to buy green perilla leaves and dried seaweed, so I went for additional shopping. At the same supermarket where I bought the bonito a few hours ago, the casher smiled at me like “Hah, you forgot to buy these?” When I came back, the rice was cooled enough. I placed the dried seaweed over a flame real briefly to lightly roast both sides, then placed it on makisu. Makisu seems to be translated as “sushi rolling mat” or “bamboo mat” etc. on the net and all of them are not wrong. It is what you see under the black, paper-like seaweed in this photo. Then I put rice over the seaweed, placed green perilla leaves, sliced garlic and seared bonito strips on it. Because I don’t like garlic tasting too strong, I left the garlic slices in water for a while beforehand. At our izakaya, three cooks work at one time, and each cook's Tosa-maki tastes slightly different. More than anything, the taste of this sushi largely depends on the quality of the bonito --- how fresh and how fatty/tasty it is, and the difference it makes is quite amazing.